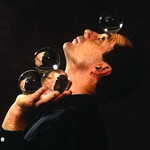 A high school dropout turned MacArthur “genius grant” recipient, Michael Moschen is an art juggler, spawning scores of imitators and an entire methodology of crystal-ball juggling he likes to call Dynamic Manipulation (the previously mentioned imitators call it “Contact Juggling,” a term that Moschen himself despises). With a penchant for discipline, choreography, and catching flying balls — and using props that include flaming torches, hoops, rods, and a ten-foot plastic triangle enclosure within which he stands, bouncing balls against the sides to achieve incredible patterns and velocities — Moschen creates illusions of speed and light that push the envelope of what is possible within this age-old circus art. Many of his techniques and routines are showcased in In Motion with Michael Moschen, a program produced in 1991 for National Public Television’s Great Performances series.